Transport and Connection represent the core network API in Grizzly 2.3. Transport defines a network transport such as TCP or UDP, including associated resources (thread-pool, memory manager etc) and default configuration for nested Connections. Connection in Grizzly 2.3 represents a single network connection (very similar to socket), depending on type of Transport it could be TCP or UDP connection or any custom connection type. The relationship between Transport and Connection is 1-to-many. 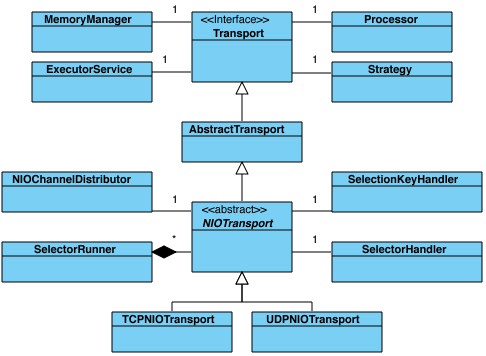 Per class diagram above, Grizzly 2.3 has two Transport implementations: NIO TCP and NIO UDP, which is based on Java NIO, though in the future, support for NIO.2 based transports and SCTP will be added once JDK 7 is available. On the diagram above we see how Connections are related to Transports and basic Connection abstractions. In Grizzly 2.3 we have TCP and UDP Connection realization, besides that we have special server-Connections for both TCP and UDP. TCPNIOServerConnection works in a similar way as TCP ServerSocket. It is bound to a specific TCP host:port and listens for the incoming client side TCP connections. When a new TCP connection is ready to be accepted, TCPNIOServerConnection accepts it and, taking into account Transport settings, it configures new connection accordingly. UDPNIOServerConnection represents a UDP connection, which is not bound to any specific peer address, so it’s able to receive all the UDP packets targeted to its UDP host:port. 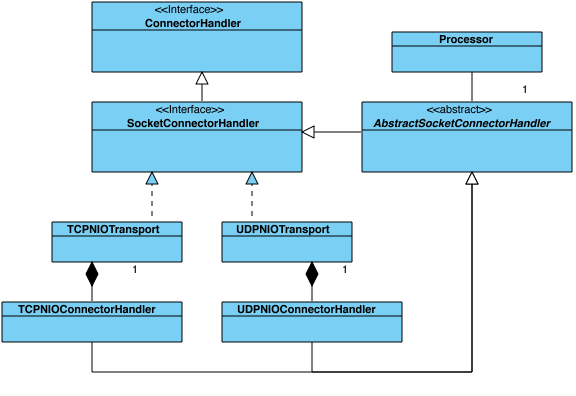 In other words the only difference between UDPNIOConnection and UDPNIOServerConnection is that the later is not bound to any peer address. SelectionKey. The Connection underlying java.nio.channels.SelectionKey, which defines the NIO SelectableChannel <-> Selector registration. The ConnectorHandler API is responsible for establishing and initializing client connections. We can describe the asynchronous connect operation as two sequence diagrams. When talking about TCP transport, when we’re on the server side and TCPNIOServerConnection accepts new client connection. 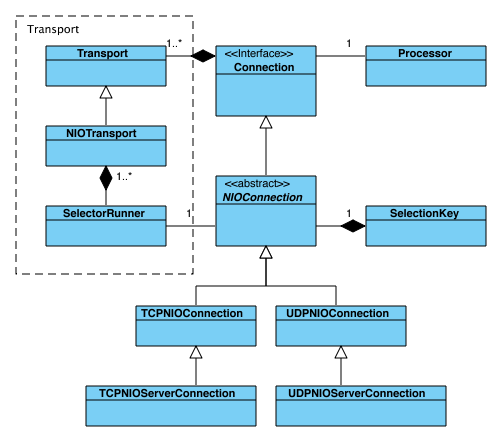 In this case the processing logic looks pretty much like the diagram above, but instead of “CONNECT” we notify Processor about “ACCEPT” event having occurred on the TCPNIOConnection.